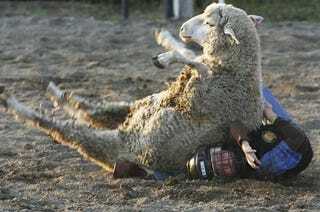 • Our photo here, shot by Marlin Levison of the Minneapolis Star Tribune and found by the lads at Out of Bounds, depicts a small child in the aftermath of either an unsuccessful attempt to ride another sheep or a very successful attempt to re-enact Shari Lewis's career. • The Knicks land Amar'e Stoudemire (five years, $99.74 million), which makes at least some sense. What doesn't is how the Suns rooked themselves out of a couple minor assets (subscription required) by mistiming their offseason moves. This probably has something to do with their not having a general manager or an assistant general manager, and the poor intern who's running the show there would do well to look up "sign-and-trade" on Wikipedia or something. At the 6th tee, he stopped at a concession stand and munched on two bunless burgers. "Don't you want any ketchup?" asked a fan nearby in a plastic lawn chair. "I'm good," Woods replied, before asking his Irish caddie if he wanted a burger too. • The body of Bobby Fischer, at whose crazy altar some of us spent our awkward years worshiping, has been exhumed to determine if he is the father of a 9-year-old Filipino girl. • The intersexy Caster Semenya is returning to competition. Good morning. It's Tuesday, and it's miserable.